For the past eight years, Deepak Raikwad’s day begins collecting singharas (water chestnuts) in his dora—a small, narrow iron boat made especially for the purpose. He expertly navigates the dora with a bamboo pole through the Nanora talab, which lies adjacent to the Brahma temple in Khajuraho in Chhatarpur district of Madhya Pradesh. After a few minutes, he bends to pluck red singharas and collects them inside the dora for sale in the local market. Khajuraho, a UNESCO world heritage site, is famous for its group of temples built by the Chandelas between 950 AD and 1050 AD, and draws thousands of tourists every year from across the world. But unknown to the visitors, singhara cultivators from the 20 family-strong Raikwad community are struggling for survival. Reason: the state government transferred the talab, used to harvest water chestnuts, to the Archaeological Survey of India (ASI). “Originally, we all had pattas (property deeds) from the Rajnagar nagar panchayat (notified area council), which gave us cultivation rights. After the waterbody was transferred to ASI in 2005, we were told to withdraw. ASI is raising a lot of objections,” says Kishori Lal, whose singhara cultivation is spread on 0.4 hectares of the 4.8-hectare talab, called Khajur Sagar in official records. 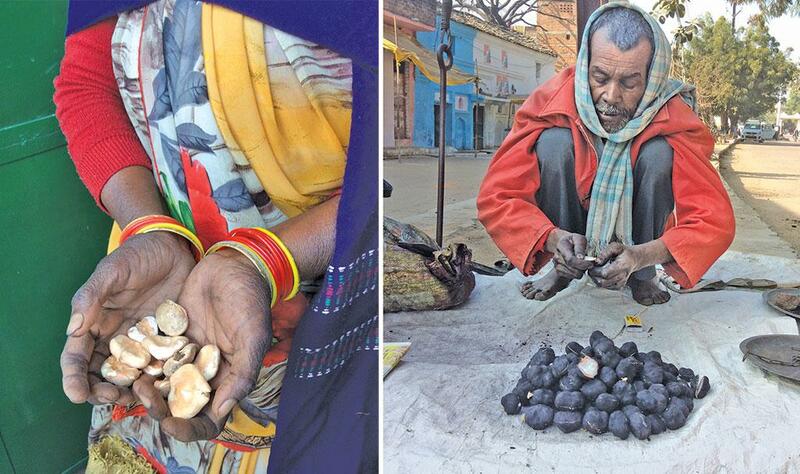 Sitting in the market with a heap of boiled singharas resembling coal chunks, Kishori Lal cuts the fruit into two with a nut cracker, dips the pieces in a tangy green chutney made with cumin powder, coriander leaves, garlic pods and fresh ginger, and offers them to tourists. He says that singhara collection is a major economic activity from October to December and involves all the family members. While men like Deepak and Kishori Lal collect the fruit from sunrise to sunset, women usually clean and boil it before sale in the local market. They also dry the fruit for a month and grind it to make powder (atta), called kori ka atta, used to make puris and halwa. “Where will we go if we do not cultivate singhara? When the talab changed hands, our pattas got cancelled. ASI wants to clean the waterbody and renovate it. But till now nothing has been done,” says Deepak. Most of the singhara growers work as labourers after the season. But during the season it is a steady source of income. “We sell kori ka atta at the mandi in Mahoba town nearby for Rs 150 per kg. Our seasonal income from singharas and its products is between Rs 15,000 and Rs 20,000. Earlier, our forefathers used to grow vegetables in the waterbody. We can also grow vegetables in the waterbody in summers when the water dries up but right now even growing singharas is difficult,” Deepak adds. For the time being, the cultivators are thankful to Vikram Singh, the Rajnagar member of legislative assembly who stood for the singhara growers. “The Raikwads started facing trouble only after the talab shifted hands, from the nagar panchayat to ASI. Although it cannot be denied that ASI has ownership right over it, I am with the people. When the decision was taken, I was the chairperson of the nagar panchayat and opposed the transfer,” says Singh. Ten to 12 years ago, many sculptures similar to those found in the Khajuraho temples were recovered from the talab, an ASI personnel posted at the Western Group of Temples told Down To Earth on the condition of anonymity. “Soon after this, the talab came under ASI. Maybe, there are many more such sculptures in the water,” the ASI personnel says. Many more factors are giving the Raikwads sleepless nights. A road along the talab that connects five to six villages leaves behind a thick veil of dust, which settles on our singhara plants, says Deepak grudgingly. Water hyacinth, which bears beautiful pink flowers locally called jolamukhi, have to be regularly weeded out to cultivate singharas. “We use nets to remove demli, also a weed. It can take up to two months. If we don’t remove the weeds, the fruits don’t grow well. We cut mosquito nets and attach them to sticks. The weeds spread fast these days because of pollution. Sewage water is being discharged in the talab. If ASI wants, it can stop the dirty water discharge here,” Deepak adds. There are insects too, which have to be controlled by spraying Monodhan, an insecticide. “Earlier, our ancestors used to catch insects with their fingers, which damaged the skin,” he says. Singhara is critically endangered under the International Union for Conservation of Nature (IUCN) red list. At a time when pollution is endangering yield, the ASI takeover can seal the fate of the cultivators forever. Deepak and Kishori Lal want to continue with their traditional occupation, and also show tourists the bird species that inhabit the talab. But everything hangs in balance for the Raikwads. “Maybe we will get the chance to plant singharas this year as the Lok Sabha elections are round the corner,” says Deepak as he clears hyacinth with his bamboo pole. From under the leaves peep out two eggs laid by Red-throated Diver (pandubi). Deepak’s face lights up and for the first time, the anxiety over the future fades from his mind.